France has launched a tender for what would be the world’s first large-scale floating wind farm, inviting companies to submit proposals for installations off both its northern and southern coasts. French environmental agency ADEME posted a tender document on Wednesday calling for proposals for wind farms of between three to six turbines, with the capacity for at least 5MW per turbine, at three sites in the Mediterranean and one site in the Bay of Biscay, off the southern coast of Brittany. 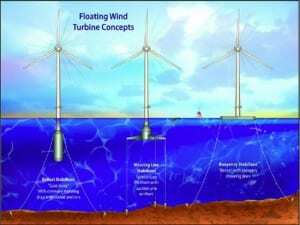 As Reuters reports, floating wind technology aims to remove limitations for offshore wind farms, which are foundation-based and restricted to sites up to 50m in depth. The technology has been pioneered by Portugal and Norway in the past few years, each with a single floating turbine, and Portugal plans to build a 25 MW floating wind demonstration farm. The French project will be the first to test floating offshore wind on a large scale, however, as part of a push by the government to encourage the transition from a nuclear-heavy energy market to one that produces at least a third of its energy through renewables. According to Reuters, the French government has made €150 million ($1US63.53 million) available for the cutting edge project, a third as investment subsidies and two-thirds as loans. Feed-in tariff bids could range between 150 to 275 euros per megawatt, according to industry specialists, who expect the government will select two or three bids with a total combined capacity of 45 to 100 megawatt, depending on the number and size of the turbines proposed. Bidders will have to propose how much capacity they would want to build and specify what sort of feed-in tariff they hope to get for any electricity produced. According to the tender document, turbines must have a demonstrated lifespan of at least two years, though the government expects the projects — if chosen and constructed — to last at least 15 to 20 years. The tender will be open for submissions through April 4, 2016.